This week I work the day shift and am home by 6. I immediately go to the fridge, check my interest and get cracking on recipes I have pinned for later. (Some of them also come from wordpress blogs I have been following. Adam also picked up this awesome new blender last night so I had to give it a try. 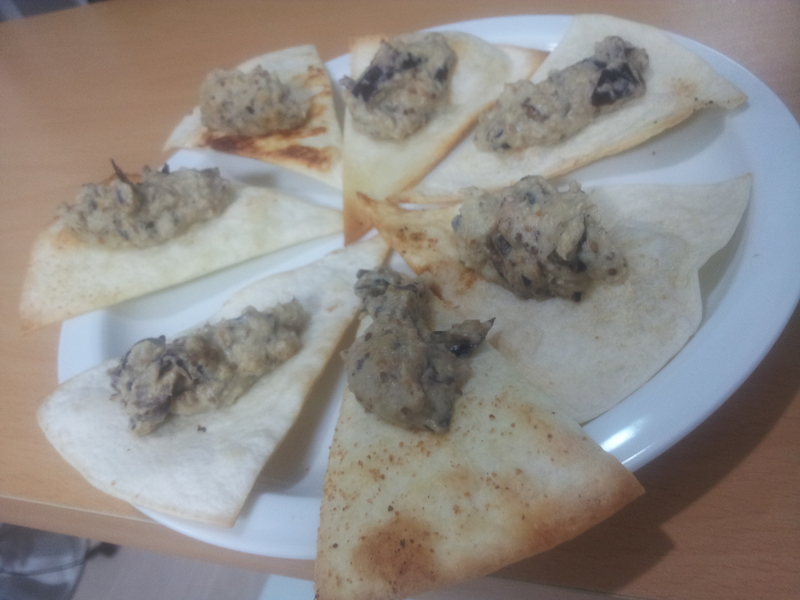 For the Baba Ganoush, I followed a recipe I found via afatgirlsfoodguide. I followed it pretty well. I didn’t have cumin so I just mixed in a few spices I found in the cabinet that sounded indianish… I also didn’t have tahini. I tried putting sesame seeds in the blender, but they are too small to blend. I ended up putting them in at the end with all of the other ingredients and they mixed in pretty well with the blender. I also threw the whole mini eggplant in the blender instead of scooping. It came out awesome! For pita chips I just took a tortilla, flipped it in olive oil, cut it, sprinkled it with garlic power and baked it in the oven for a bit until it looked crunchy. Slice your aubergines down the middle and drizzle with olive oil, then roast them in the oven for 20-30 minutes until they are soft inside and the skins are crinkly. I also roast the garlic at the same time. After they have cooled scoop out the flesh and mash with a fork, or you can do this in the blender. The more traditional way is to just use the pulp inside, but i don’t like to waste the skins so i usually blend them up too (I dont think it really affects the taste either way). Add the roasted garlic and tahini and blend again. 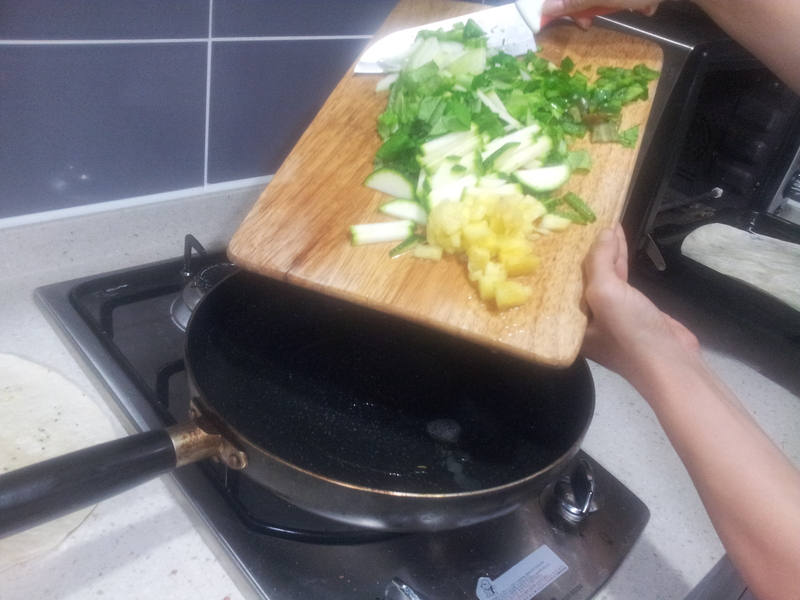 Then stir in the cumin, lemon juice and salt to taste. Drizzle with olive oil, paprika and some chopped fresh herbs to make it look pretty. 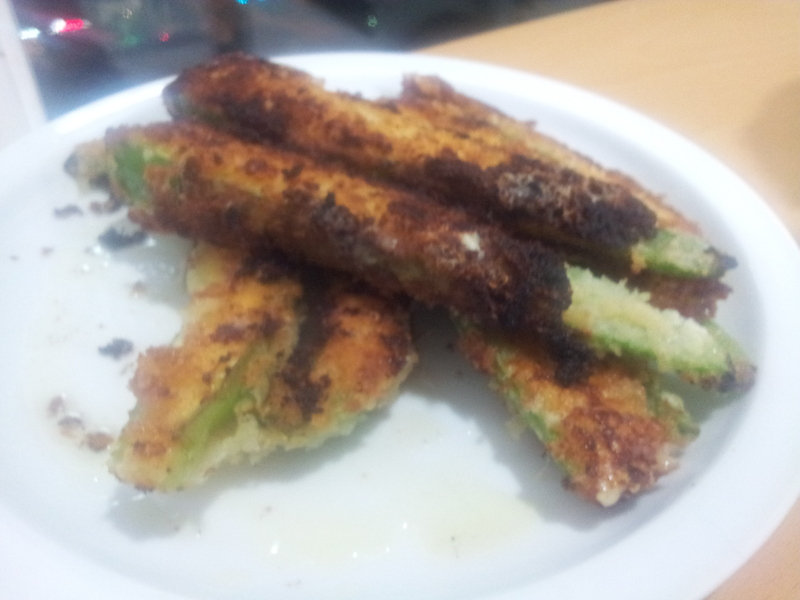 Then I tried making jalapeño poppers, I picked up the recipe from v1valavegan’s blog. I had picked up jalapeños at the market on Tuesday, 1 dollar for 12. I only used about 4 of them, they were really big. I used mexican cheese (its what we had in the house) and regular cream cheese (as not a vegan). I have the hardest time breading anything so at times the batter came off and the pepper was a little bald, also my jalapeños seemed spicy when I washed and cut them but when we ate them, they were more mild…but they tasted great! 3) -heat 1 inch of oil on low heat in a skillet or sauce pan ( I used a skillet) watch the oil that it doesn’t start burning. 4) stuff the jalapeños with the mix. 5) – in a bowl pour 1/4 cup of soy milk. – on second bowl pour 1/3 cup of all purpose flour add salt and pepper. – on third bowl pour half a cup of bread crumbs. 6) Dip stuffed jalapeños into milk then into the flour and shake off any excess flour and continue on to all the jalapeños. 7) Dip the jalapeños back into the milk and then into the bread crumbs. Make sure they are fully coated. Repeat this to all the jalapeños. 8) Make sure the oil is ready to fry these bad boys by sprinkling some flour into the skillet. It should sizzle and now your ready to fry. 9) Carefully place the coated jalapeños into the oil and watch them sizzle. Fry them for about 2-3 minutes turning them as they brown evenly or as to your desire. 10) Place on a paper toweled lined plate to drain. Let sit for about 2 minutes then serve and enjoy with dipping sauce as a main course or side dish. 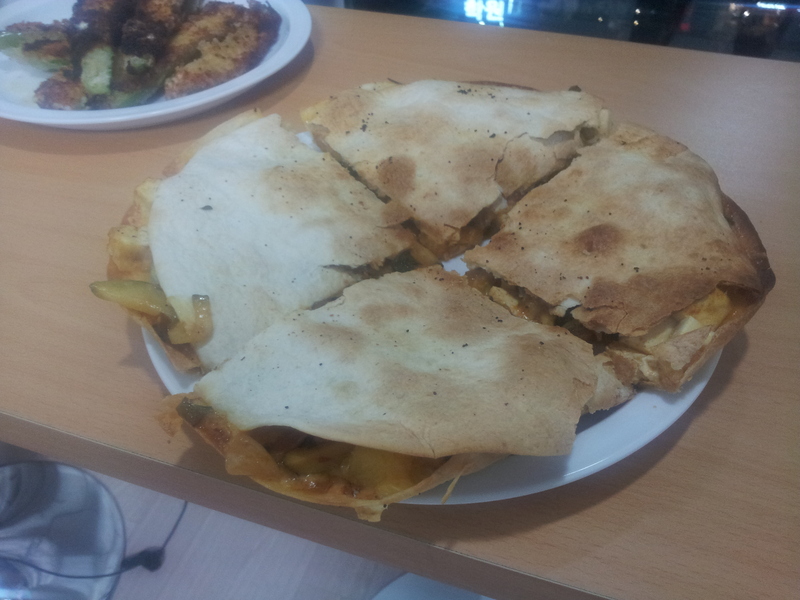 Lastly, was the Quesadilla. OMG, it was fabulous. I used the Pioneer Woman’s Website as a guide but altered it a bit. Maybe I do have to work on my food pairings..I mean Baba Ganoush with Quesadilla’s?? Overall we ate more than our share of veggies last night, so in a way it was still super healthy…maybe minus the cheese would have been a bit better for us. Hm… tonight, executive decision, no cheese in dinner. Any ideas on what to make tonight? Previous Super Cool Korean Paper Towel Capsules….